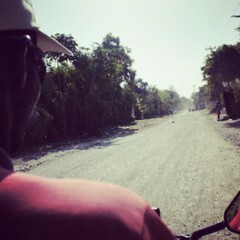 As much as I travel it is amazing to me that the first time I’ve ever ridden a moto was last week in Haiti. It was my two-wheeled taxi each time I visited L’Hôpital Sainte-Thérèse with Midwives for Haiti. The short ride over rocky, rural roads with frequent potholes of mud that the driver had to dodge was exhilarating and provided a much-needed respite from the stifling heat that spreads across Haiti as soon as the sun is at its highest. The only thing that could have made the ride better was sunglasses. I forgot mine back home and didn’t buy any while I was in Haiti. Every time a caravan of SUVs or big trucks passed, a tornado of dirt and sand was kicked into the air and made its way into my eyes. I really needed my sunglasses in those moments, but I managed. I took these photos on the way to the hospital. It was one of the few times I had to really be outdoors and close to the roadsides where people live and work in their markets as I was quite busy until after five in the evening. 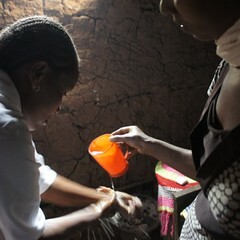 I loved seeing two women hang sheets out to dry on cactus plants one morning as we rode by. It reminded me of the juxtaposition of both the simplicity of doing something mundane and everyday and the necessity of making sure the chore gets done. While I and many others whizzed by on motos, others rode traditional transportation – horses and donkeys. In Hinche, a poor, rural town in Haiti’s Central Plateau, horses and donkeys still provide an easier way of life for many as they are strong enough to carry goods to market or to carry heavy jerry cans of water on their sides. They aren’t as fast as cars, SUVs, and motos, but they are thoroughly needed in an economy that still relies on a more traditional way of life. After my moto rides, I made it to the hospital where I spent time visiting the maternity wards where Midwives for Haiti works and saves mothers’ and newborns’ lives. I’m finally back home now. I only stayed for a short four days, but in that time I visited three cities, two hospitals, one health post, and an orphanage. I stayed in two guest houses and one brand-new hotel in Port-au-Prince. It was nice to see middle-class Haitians indulging in the restaurant and bar there after seeing very stark poverty. I also rode up winding roads in the Mirebalais mountains and along the beautiful, turquoise coastline. I ate fresh bananas, watermelons, mangoes, and pineapple and tasted some of the hottest hot sauce I’ve ever had and it was glorious. I drank Haitian beer and probably too much Coca (Coca-Cola). I also was a feeding station for many mosquitos. It was a busy, but productive time. I can’t wait to go back! Read more of my posts and see more photos from my short trip to Haiti last week. Also, see my Vine videos of my trip through Haiti’s Central Plateau and Arbonite regions. Next Do You Know This Fruit Tree?